The Complicated World of Cloud Value: Which one is the right one? 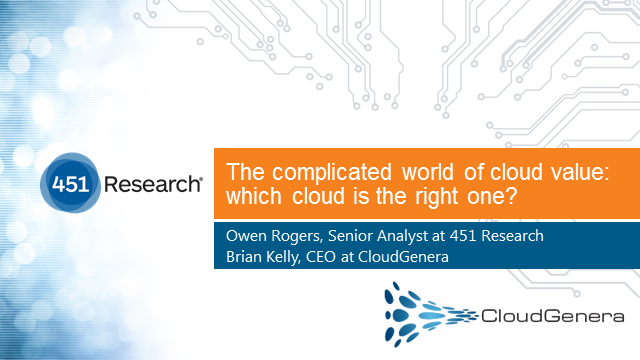 To examine the real-world cost of cloud over time, 451 Research’s Cloud Price Index has been tracking the price of cloud since 2014. Like a consumer price index, our CPI is made up of a basket of goods, but in our case, it is a specification of the services required to operate a typical Web server application. The index shows a complicated and ever changing market where value, performance and even just price are difficult to measure. Being aware of the differences between options is the first step to gaining best value, using tools to compare them can ensure ongoing suitability. Use CloudGenera's data to give you insight on the best venue and service model to run your relational databases. We'll focus on MySQL, PostgreSQL, Oracle and SQL Server across AWS, Azure and Google. The VMware cloud on AWS may be a valid part of your cloud strategy. This Webinar will talk through pros and cons of that service. Several major public cloud providers now have reserved pricing. Which reserved services are worth the investment for your business? How much of a discount do reserved services typically offer? During this session you will learn how to bring clarity to help make cloud decisions in minutes, not months. Jason McKinney will be presenting. CloudAssist™ is the portal through which you research cloud options and map your application portfolio to the best cloud solution. Assess application profiles, model transformation scenarios, and discover the best execution venues for your needs based upon user demographics, service levels, security, technology and total cost of ownership. Our needs based data-driven platform help businesses of all sizes select cloud solutions, establish governance around their cloud usage and drive adoption of a cloud strategy. CloudAssist™ is the portal through which you research cloud options and map your application portfolio to the best cloud solution. Title: The Complicated World of Cloud Value: Which one is the right one?